Some 4 years back, I posted my first presentation here, titled "LTE Femtocells: Stepping stone for 'killer apps' presentation". I had couple of apps in mind that I thought could benefit from both LTE and Small Cells (or Femtocells to be specific). The first was your phone acting as a Wireless Hard Disk Drive (HDD) that can be used to store things remotely in a server somewhere. This is similar to what is known as the Cloud nowadays. features low latency, which is vital to the small flows and sessions that characterize M2M communications. The rise of both cloud services and LTE creates a virtuous cycle. Cloud services continue to grow, which helps operators sustain their LTE business model. That growth enables them to accelerate LTE investments. Then operators can support new types of enterprise services, including cloud-based applications. an increase in capacity that starts to put mobile connectivity on par with fixed broadband access. My reasoning for Small Cell here is, in most cases when you are doing operations that require large amounts of data to be transferred, you will be indoors, either at home or in office or in a low mobility scenario. The requirement for high security and at the same time high speed data transfer that should not be affected by other users in the cell (capacity issues) can be easily solved by using a Small cell (Femtocell for indoors, Metrocell for outdoors). 3UK's wholesale division on Friday detailed plans to capture high-margin machine-to-machine traffic by partnering with service providers that are likely to have higher-than-average bandwidth requirements. As a 3G-only operator, the company cannot go after high volume, low margin M2M traffic because it typically only requires a 2G connection. However, there are opportunities to use its 3G network to address more data-hungry verticals that will generate higher traffic volumes. "The margin on one CCTV M2M connection is more than 50 times bigger than the margin on a smart meter connection," claimed Tom Gardner, lead wholesale manager at 3UK, during Breakfast with Total Telecom in London. "There is one CCTV camera for every 14 people in the U.K.," he said. "If I can put a SIM in every one of them I'll be a very happy man." 3UK, which on Thursday launched its Ericsson-based wholesale M2M platform, sees a big opportunity in CCTV, particularly for mobile and temporary installations at festivals, for instance. Other potentially lucrative sectors it has identified include digital signage, back-up for fixed Internet connections, and backhauling WiFi traffic from public transport. I am sure some of you may be thinking that '3' UK uses HSPA network, not LTE, which is true. The point here is that it could be done better using LTE and Small Cells. The reason for using LTE would be to provide higher data rates, meaning that information can be sent faster, with higher resolution and more regularly. This will help identify the problems earlier. If the CCTV is used indoors or in high usage areas, it would make sense that it connects via Small Cell to avoid creating capacity issues in the Macro network. • 60% of consumers are interested in femtocells now Another interesting statistic was that there are now more 3G femtocells in the world than there are 3G macrocells, which again agrees with data stating that 60% of operators think small cells are more important than macrocells in the success of LTE. According to the Ubiquisys blog: Simon’s thoughts are best summed up with a sort of rallying cry he came up with: “Our cells are small but our goals are not”! This was followed by, Thilo Kirchinger, Principal Product Manager forVodafone Group. He discussed Vodafone’s operational stance on femtocells and small cells, and during which confirmed that Vodafone would indeed be launching LTE femtocells. • Thilo also spoke about how he sees femtocells integrating and being used by people in home environments. For example, instructions for home femtocells should be as simple, with as little technical information as possible, limiting potential confusion for the end user, while voice communications is still the biggest draw for this kind of residential femtocell (despite the fact that people tend to use a lot of data for things like app browsing when at home). • There are now 9 Vodafone subsidiaries with commercial femtocell service – almost a third of the total – and more are to follow shortly. • Research showed that some 34% of the UK either have insufficient or unsatisfactory indoor mobile coverage and Wi-Fi only partly solves the issue. • In summary, he'd like to see accelerated standardization of the Iu-h interface, for the femtocell supplier ecosystem to start engaging with the Connected Home industry and for femtocell costs to reduce further. • David Chambers of thinkfemtocell.com asked how operators, such as Vodafone, with strong brands of being the best mobile network and coverage could reconcile asking customers to pay for a box to fix poor coverage problems. Thilo felt that femtocells were complementary (especially for growing indoor use) and by offering both (ie great outdoor macrocell coverage plus great indoor femtocell service) it gave them competitive advantage. Another question related to 3rd party broadband internet – he reported that this hadn't been a problem, especially where customers conduct a speed test as part of the pre-sales process. Telecom Italia’s Ferruccio Antonelli took the third slot of the day with a presentation focusing on the company’s commercial trial and proposed launch of femtocells in Italy. • Telecom Italia Mobile (TIM to the locals), has always been a bit of a trendsetter in the mobile industry and is one to watch. They have the highest penetration rate and smartphone takeup of any European country. They will launch femtocell services next month (the precise date is commercially withheld), with Alcatel-Lucent providing two sizes of femtocell (seems very similar to Vodafone products). • It won't be mandatory to use Telecom Italia broadband – any third party wireline/cable broadband can be used. While the pricing also can't be revealed, their billing system will be flexible enough to offer different prices when customers are using their "femtozone" at home. • It sounds like it’s been a time of experimentation in Italy for femtocells thus far, but signs are looking good, with Ferruccio stating that femtocells will see launch in the second half of 2011. There was also some discussion on Twitter stemming from Telecom Italia’s idea of a ‘femtozone’ tariff or simply keeping pricing the same. • A major issue for their implementation was the regulatory requirement to know if the femtocell has been moved (so that emergency services go to the right address) – this is checked by ensuring that at least one external macrocell ID is the same as when the unit was first installed and/or that the Telecom Italia broadband IP address matches. • Unusually, TIM want to have SIM cards to authenticate their femtocells – so for example faulty femtocells can be replaced and by swapping the SIM card would automatically reconfigure for that customer. Some insights from South Korea was provided by Samson Tae-Yong Kim from SK Telecom, whose presentation focused on using femtocells for data offload. • Of particular note was the disparity raised by Kim in terms of data usage between different types of phone. For example, some smartphone users are consuming as much as 1 gig of data on an ‘all-you-can-eat’ plan in the same amount of time that it would take a feature phone user to consume 10 megs. It’s also worth mentioning at this point that 20% of mobile phone users in South Korea have smartphones, and this number is sure to grow. • South Korea Telecom (SKT) plan to deploy some 10,000 public hotspots before the end of the year, many equipped with both Wi-Fi and cellular. They've previously used a lot of repeaters to ensure excellent (voice) coverage, but now need to bring in heavy additional capacity and higher speeds. • This is a generation that is watching 2 billion Facebook videos a month and 2 billion YouTube videos a day. • Alcatel-Lucent expects mobile traffic growth to be in the order of 30x in the next five years. • Just look at the iPad – users consumer twice as much data (and signalling) as the average iPhone user. • What’s the problem? Signal to noise. As Claude Shannon at Bell Labs in 1948 theorized, a network is limited intrinsically by the noise generated by the media and the users. As you get more users, it degrades the overall capacity of the network. • LTE, despite being more spectrally efficient than 3G, has a theoretical capacity limit, under Shannon’s Law, of 3.5 mbps per hertz. • Kemp then moved onto the business case for femtocells. You need initially to improve customer retention because keeping customers is a whole lot easier than gaining new ones. • Femtocells result in a 60% downlink improvement, and a 26% uplink improvement. With lower latency, customers are happier with their voice calls at home and churn less. You can build a business case for home femtocells on this alone. • Metro femtocells have even more compelling business case. The more traffic is offloaded onto small cells, the users on macro cell also see a service improvement. • Steve also raised a point that kept reappearing through the morning: iPads (and tablets in general) are far more data hungry than iPhones/smartphones, which is certainly food for thought when considering the sudden surge in popularity of these devices. • Alcatel-Lucent also announced their femtocell application developer kit, which is based on the recently published Femto Forum femtocell API specification. Already 23 developers have signed up to use it, with the first application to be made available by Telecom Italia when they launch. As the morning progressed, it was the turn of Nigel Toon, CEO at Picochip, to present his thoughts and findings on the impact of femtocells on network performance and capacity. • Nigel noted that voice communication is still one of the most important reasons why people select a carrier. Nigel also raised the point that no one really knows by how much mobile data traffic usage is expanding (or due to expand), with various different proposals raised during day one of FWS 2011 alone. • Mobile data traffic exploding – you guess by how much. Is it 30x, 50x or even 1000x ? • Currently carriers spend, on average, 20% of their revenues on capex. And the cumulative amount of capex is increasing 8% year on year). • Need to serve customers more efficiently and at a lower cost. • Today a user in the middle of macrocell might only experience 40kbps. Tomorrow, with femtocells, the user can enjoy 8mbps while increasing the performance (less crowing on the macro) to 170 kbps. • The key to low cost deployment is self-organizing, self-configuring, interference management and remote management. • Picochip reaffirmed the issue of replacing repeaters with additional capacity, suggesting that rationing wasn't the right answer for customers who have grown to love data access. The web will only increase reliance on data connectivity and network operators will need to respond by building out a new network layer to meet demand. Nitin Bhas from Juniper Research discussed the principals of mobile data offload and onload, where ‘offload’ means data migration from mobile to fixed, and ‘onload’ vice-versa. The spectre of tablets such as the iPad and smartphones being data hogs was once again raised during Nitin’s presentation, as was the important of the ‘offload’ of data due to this very reason.Mobile data traffic from smart phones, tablets and other devices to grow to 14,211 petabytes by 2015. This will be equivalent to 18 billion video downloads. By 2016, 63% of this will be offloaded to Wifi or femto. • Malaysia has 120% penetration, expected to rise to 150% within 5 years. 28 m population. • 70% of market revenues come from 8% coverage area. Highly urbanised. So when UMobile launched in 2007, made sense to target where 70% of the revenue was coming from. • Currently has 1200 node Bs and roaming onto 2G partner network. • Price is in decline in Malaysia, ARPUS are falling for voice. The market has reached revenue saturation. 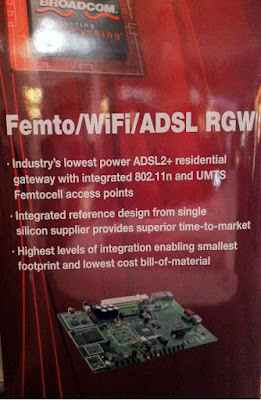 • Umobile has limited capex, so trialling femtos with Alcatel-Lucent. Using home and hotspot femtos. • Plan to launch femtos commercially. Will improve indoor coverage, data offload, reducing roaming costs (because they have to pay their 2G partner) and bundled services. • Malaysian govt has target of 75% BB penetration by 2016. • However their strategy is somewhat hampered by a local regulation (tax) of around US$600 per cellsite – not really significant for macrocells, but a serious problem for thousands of femtocells. • Continuous Computing launched their "Femtotality" software product. No longer limited to just the protocol stacks, they've invested an additional 150 man years in their application layer (I believe this figure includes an acquisition, otherwise their 200 staff would have been working a lot of overtime) and now offer SON (Self Optimisation), remote management and configuration features too. • NTT DoCoMo was able to restore cellular service after the earthquake/tsunami in just 6 weeks after 4,900 cellsites were put out of service in the Tohoku region alone - femtocells were part of the solution. They plan to switch off their 2G service next year and have already launched LTE. They intend to deploy LTE femtocells as soon as possible. • Finally, Broadcom’s Shlomo Gadot gave a provocative presentation where he outlined a compelling vision for femtocell technology. He sees no reason why Wi-Fi hardware should be cheaper than femto in future, and named integration as a key trend. Following this trend, Shlomo gave more details of the forthcoming integrated WiFi/Femto/ADSL residential gateway, the first of its kind, announced by Ubiquisys earlier that same day. Dr Alan Law of Vodafone Group talking about femtocells beyond the home. • Vodafone’s vision started with consumer cells, and great things are happening both at home and abroad with this arm of their femtocell operation. But where do you take femtocells when looking beyond residential? • Vodafone has been trialling its enterprise and rural cells, and some interesting information emerged when Dr Law recounted some statistics from their rural and enterprise test deployments. The amount of dropped calls noticeably decreased when voice and data was offloaded onto the femtocell – which means better quality of service for Vodafone’s customers. There are still some challenging aspects to rural deployment such as IP transport and power locations, but on the whole results were positive. • Vodafone’s enterprise femto trials have also been successful, with data services noticeably enhanced in enterprise environments when femtocells were brought into the mix. The company’s ‘Metrozone’ concept would provide extra network capacity for data offload in denser urban areas. Next there was a fascinating presentation from Rick Vergin, CEO of Mosaic Telecoms. He represents a rural telco, and outlined the problems of serving customer who live predominately in farmland or forest. It is desperate to deploy femtocells to not just plug gaps, but create coverage for the first time. Cellular coverage is the chief concern: macrocells can provide coverage to population centers (towns over 200 people) and microcells can support where people gather regularly (schools, for instance). But thousands live outside this coverage area. • First problem is geography: most of Mosaic’s customers live towns with 200 people up to a small city with 9000. But the 9000 square mile coverage area within its 3G license, comprises mostly farmland or forest – and potentially 100,000 people. • Mosaic runs 3G in band IV, a relatively underused part of the spectrum from a global perspective. This has caused unprecedented problems with femtocell vendors, with Airvana, Technicolor and Arcadyan all contracted only to subsequently drop out one at a time. Finally, with the guidance of Nokia Siemens, Ubiquisys was selected. • Farmland is not so bad, but forest is very challenging for the Mosaic’s 35 macro cell sites. CEO Rick Vergin lives 200m from a main road, and 2 miles from the nearest macro cell. On the road, he has line of site and 4 bar coverage, at home he barely has 1 bar coverage. Many of the potential customers in their licensed area have no coverage. • The femtos will bring coverage to people with currently little or no coverage. Moscaic has no intention to use femtos to create ubiquitous coverage – that would be way too expensive. But what they can do is give subscribers coverage most of the time: at home, at school, at the cafe. It will only be on the journeys between that they may have no bars. • The rural customers of Mosaic will also benefit from LTE because it will be used to backhaul the femto traffic and also provide broadband access for the first time (remember many of these properties will be far away from an exchange and may not use satellite or microwave. Mosaic will use the 750MHz LTE for residential broadband access, and bundle VoIP and femto/cellular with it. (750MHz is much more spectrally efficient than its 1700/2100 MHz 3G spectrum). • This is a great case study for not just the 1000 rural US telco but for any operator that either operates in the rural segment or has universal access obligations. Peter Agnew of Colt Telecom took to the stage to present his views on what it takes to overcome the barriers to launching a femtocell service through fixed and mobile collaboration. If that sounds like a bit of a mouthful, all will become clearer in a minute! • Colt Telecom is a large pan-european fixed line operator, working in 21 countries with organisations such as major banks. Peter proposed that in working together with a fixed line operator such as Colt, mobile operators will have an ally in femtocell deployment, aiding connectivity, quality of service and increasing the mobile operator’s access to enterprises. • In essence, what Peter and Colt are proposing is ‘femto-as-a-service’ (‘FaaS’), which was met with some figurative nods of approval on Twitter. Peter finished his presentation by noting that for something like FaaS to work, self-organising network technology would almost certainly need to play a role in such a deployment. • It’s an important development for operators wanting to take their first steps in femto, which often starts with the low-risk bit low-volume enterprise route. This solution is the first to remove the barrier of high up-front gateway and integration costs, and the subsequent reliance on volume in the business case. • Another approach, and its not one that COLT said it would necessarily be offering, is to provide in-building installs (as long as there is not radio planning). It makes sense for a business telco with experience of firewalls, LANs and so on to assist both enterprise and mobile operator in this area. • In dense metropolitan areas, most subscribers are sitting within an office. It makes sense to bring coverage closer to these users, and not charge the enterprise for this (either for the access points or in-building cabling). It improves the coverage of the enterprise subscribers and for everyone else in the macro – both are sufficient incentives for the mobile operator to foot the bill. • However, more bandwidth available means more consumed. COLT asks, do mobile operators have the fixed-line infrastructure and core-network to cope with the increase in backhaul requirement? 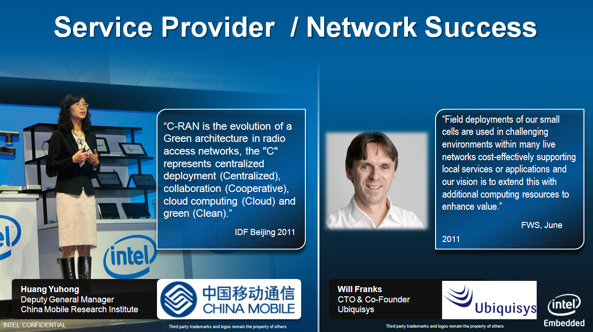 • Cisco’s Mark Grayson, spoke about mobile offload architectures. One of Mark’s main points that resonated with the Twitter audience following the #FWS11 hashtag was that the cost for networks is dealing with the non-uniform peaks in mobile internet demand. • In their previous experience with large sporting events like the Superbowl, Cisco noted that the volume of traffic leaving the stadium was greater than the volume entering – all thanks to social media services such as Facebook, YouTube, etc. with people sharing content, something that Intel’s Steve Price raised later on. 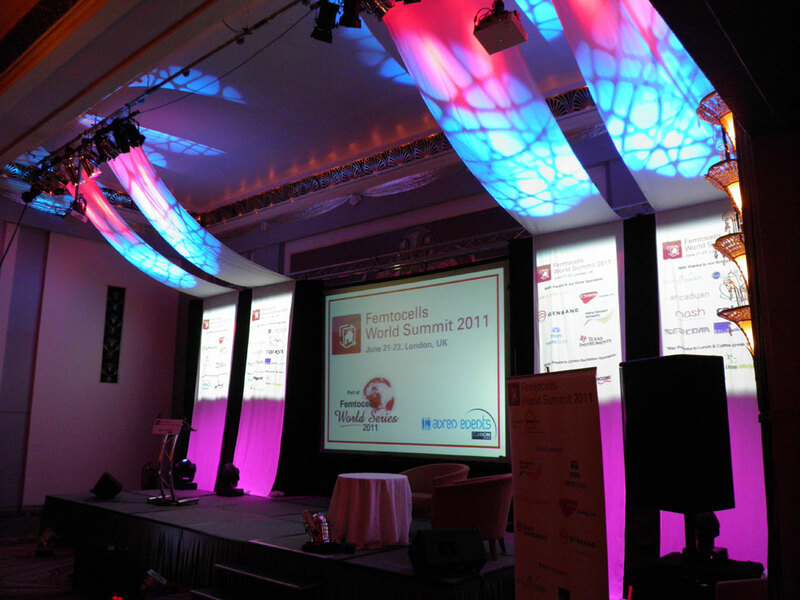 • Mark suggested that the move to small cells will require a change in mindset, and put forward a suggestion for using converged Wi-Fi/femto architectures for macro offload of indoor traffic – and he also noted that cellular small cells would need to prove themselves at the high densities already deployed with WiFi. 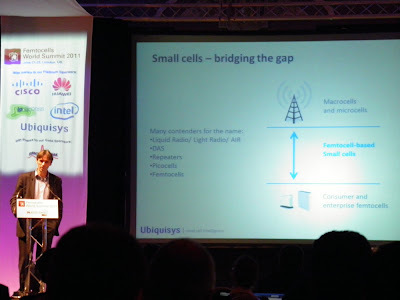 Ubiquisys’ CTO and Founder Will Franks, with a presentation on the next generation of small cells. • Will started things off with a brief discussion on the evolution and naming of small cells, describing how things have progressed from early residential femtos, all the way to some of the especially advanced outdoor and rural models. • The building blocks for the next generation of intelligent small cells, Will stated, are 3G, LTE and Wi-Fi. 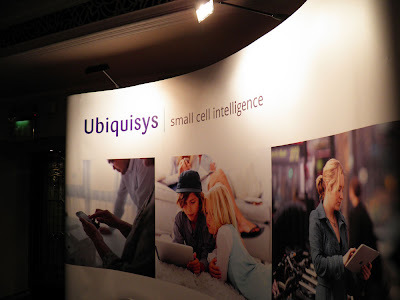 This, combined with the continuous adaptive behaviour offered by our self-organising network technology, helps Ubiquisys small cells to form part of the recently discussed ‘Edge Cloud’ – something also raised in Intel’s presentation. • Will went on to describe how small cell hotpots will be deployed in the real world, and broke down small cell technology into layers. Starting with the hardware platform (featuring Texas Instruments’ simultaneous dual-mode 3G/LTE), through continuous self organization and self organizing networks, and on to edge cloud computing platforms (Intel) and cloud control systems. • Ubiquisys reported that Softbank Japan have been able to deploy rural femtocells in just 3 days using satellite backhaul. Their "self optimising femto grid" even works for clusters of rural femtocells at 2km range. Competitive operator Network Norway, thinks it has the answer for small businesses in Norway. • Combine mobile centrex with femtocells. Norway is a country that was at the leading edge of fixed-mobile substitution. 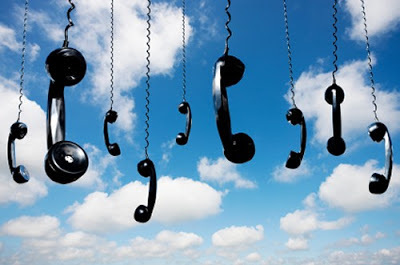 • According to Network Norway, 64% of all calls originate on a mobile and 79% of call minutes terminate on a mobile. This is a very mobile friendly country and, believed Network Norway, businesses would be very receptive to mobile centrex. • The problem is buildings: all that concrete, glass and basements make ditching the desk phone an impossibility unless you can bring the mobile network indoors. DAS (distributed antennae systems) are too expensive for most small businesses. Femtocells are not. • Network Norway launched a small business femtocells to make their Mobile Centrex service more compelling. The mobile PaBX service offers hunt groups, stats on attendant function, private number plans, conferencing etc. • What is interesting to me is that they have built smartphone apps (for Ovi, iPhone and Android) which allows users to set up conferences and see presence/availability in contacts (which comes from femtocells). • In other nomenclature, this is called “collaboration”. Or even unified communications, if you use the IM, email and SMS functions on your smart phone. • So benefits for small businesses: flexible communications, collaboration, guaranteed coverage in the office, seamless experience, no capex. The last presentation day 2 featured Steve Price of Intel, with a look at how to ‘differentiate the small cell user experience with an intelligent, application enabling architecture’. • The internet and mobile internet are both growing rapidly, with the “Gigabit Generation” particular fixated on social networking, which now has a considerable impact on network traffic at large. Service providers are now presented with a great opportunity, Steve said, as they can now take advantage of the fact that they are directly involved in the process. • The next step is to make sure that intelligence is present throughout the network – and just as important is its location. These intelligent services ensure that the user will be getting a better experience in the end. • The two key trends identified by Intel were cloud RAN, with China Mobile named as an example, and edge cloud, where the Intel-Ubiquisys collaboration was given as a prime example. Complete Details on Femto Forum Website here. • The femto vendor community seems to be frustrated by the slow rollout of Femtos by the network. The technology has been proven and from what I see, if a network is rolling out Femtos, they are getting good reviews and reception from the user community, even though they may have to shell out a few bucks. • Verizon reported tremendous success when using their femtocell (the Verizon Wireless Extender) to reduce churn. They've also successfully offloaded heavy users from their macro network in Chicago, by sending them a free femtocell – both improving speeds for those high users as well as releasing capacity on the macro network for others to benefit from. Their femtocell solution works well and they're very happy with it. You still can't buy a femtocell in a Verizon store because It doesn't fit with their corporate branding of having the best network. • In contrast, Vodafone don't seem to have suffered any loss of brand image by promoting Sure Signal – their network brand remains strong and is arguably strengthened by saying they are the only one who can truly guarantee full service indoors anywhere (assuming there is a DSL line to connect with). Vodafone Ireland jokingly apologised for the lower approval figure than Vodafone Greece during their femtocell trials - only 96% (against 98% in Greece) would recommend them to their friends and family. They explained how they had carefully crafted their marketing message to celebrate the positive aspects of their customer's individual homes (thick woods, stone buildings, basement flats etc.) and how simple it was for them to have 5 bar coverage. • Comcast have built out a lot of Wi-Fi hotspot capacity in addition to their wireline/cable services. They believe in the long term, the usage mix of traffic on wireless will be a similar profile to wireline today – say 50% entertainment (including video), 20% web surfing; a total of 13GB/month. Comcast has deployed some 5000 WiFi hotspots so far, and plan to build out 100K over the coming years. Wi-Fi has some new features coming – the new HotSpot 2.0, which Comcast will be trialling later this year. Greater use of the 5GHz spectrum will help reduce congestion in high traffic areas. Sports stadiums seem to be the biggest challenge – many users wanting to watch video at the same time, with others trying to use Mi-Fi (cellular to Wi-Fi adaptors) at the same time/in the same spectrum. • Contela explained how they use femtocells in Korea to offload data traffic. Unusually, the system deals with voice and data traffic differently – switching voice calls to the normal macro network while handling as much data traffic as possible through femtocells and Wi-Fi. • TOT, Thailand, a relatively new entrant to mobile explained how they can install femtocells at public payphone booths as a quick way to find sites with backhaul connectivity (using DSL) and power. Getting the height of the unit is important – it needs to be slightly out of reach. They also showed their disaster recovery solution – which uses femtocells + satellite backhaul and can be rapidly deployed. In these situations, providing a fixed/wireline phone service isn't useful – most people now have all their phone numbers held in their mobile phone and not written down. Mesh backhaul, linking clusters of femtocells to each other using wireless and aggregating the backhaul to a few egress points, is also a useful option – a maximum of 5 "hops" using a so-called spine and rib architecture matches urban street layouts. • Stuart Carlaw from ABI Research. Growing number of employees have more than one phone they use in the office (one corporate + one personal). Both phones have mixed voice/data use. After some retrenchment in 2009, voice has continued to grow and is now 779 minutes average for corporate users. Video and picture messaging are being used by enterprise users (on their corporate liable phone) more than ever before. The growing demands of employees are giving their IT departments a major headache, for which enterprise femtocells will be a major part of the solution. • The Femtocell Application developers toolkit from Alcatel-Lucent isn't locked into their solution. Applications developed and tested using their SDK should also work with any other femtocell system that also conforms to the Femtocell Application API. • There were a number of operators present at the conference who are clearly there in an active capacity. Most were pretty tight lipped about their plans, but all seem to acknowledge that femtocells will play some part in the story. Some Final thoughts from the Ubiquisys Blog. • The latest Informa femtocell market status report, produced for the Femto Forum this week, confirms the strong growth trend with nine new commercial launches in the past quarter alone. • Both operators and vendors alike were talking about femto technology being used in public-space small-cell hotspots to provide a capacity boost in high demand areas. At least half of the presentations touched on this topic in one way or another. Is it because the growth in data demand is beginning to be felt? Or is it that the low opex and backhaul costs of femto are making a strong business case? In any case, many of the questions about public space small cells were mentioned, such as interoperability with the macro layer and how the necessary high density deployment of small cells will be achieved. The questions were mentioned, but solutions were not – a sure sign of innovative work in progress. • Colt Telecom unveiled femtocell infrastructure as a service. Because many operators want to make their first femto launch into a low-risk segment, they often opt for SME (small business) rather than consumer segments. Yet the lower volumes in SME can damage the business case, because the upfront costs of the core gateway and systems integration are shared between fewer customers. By offering an incremental managed service cost, fixed line provider Colt might just have made it easier for mobile operators to start femto services. • Broadcom unveiled a fully integrated femto residential gateway, Texas Instruments won an award for their powerful new 3G/LTE SoC, and Intel presented a future powered by compute platforms in both cloud RAN and edge cloud environments. • There was a degree of consensus that LTE will be seen first in small cell hotspots, the same hotspots that need to deal with a deluge of 3G data demand over the next few years. Several speakers mentioned that this calls for small cells that can run 3G and LTE simultaneously, like those new SoCs from TI. • A few years ago you would have seen quite a few femto vs. Wi-Fi presentations, but no more, which is quite a relief to us, as we have been behind combined femto-Wi-Fi devices since 2008. 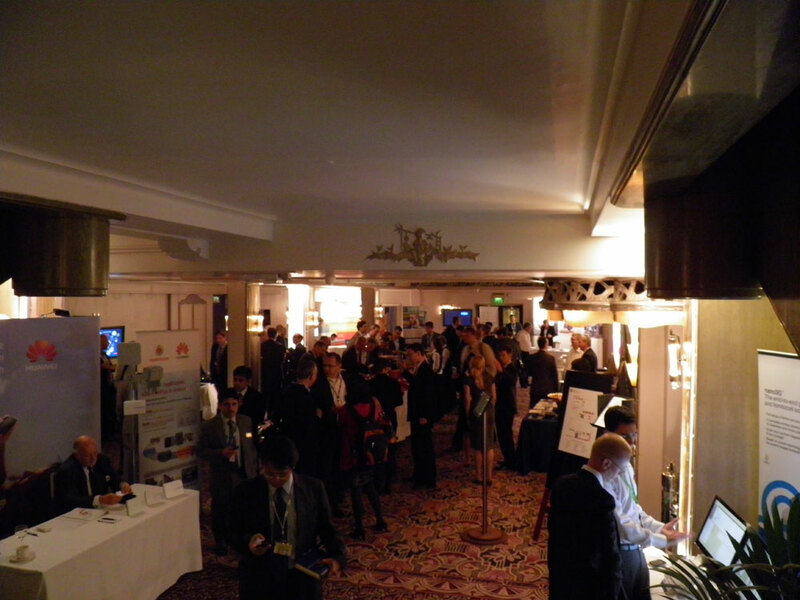 There was much discussion of harmonisation in home and business environments. In public spaces, the idea of tri-mode small cells replacing Wi-Fi hotspots was raised. These would maintain the Wi-Fi capability, but add 3G and LTE cellular, opening the possibility of using cellular’s invisible “login” to replace Wi-Fi’s usual usernames and passwords. These three interesting presentations embedded below from Mobile World Congress 2011 are available to download from Femto Forum website here. More on HTC Freestyle and Brew OS here. More on Live translating service here. Femtocells: Not merely for providing 3G without base stations. Argela, one of the leading global telecom solution providers, was an exhibitor, speaker and sponsor of the Femtocell World Summit in London which is billed to be the largest Femtocell focused event in the industry for 2010. In addition, Argela’s Femtocell Committee Advertising Application was shortlisted and recognized by the Femto Forum Awards Panel for its innovative application of the Femtocell technology. Argela’s Director of Technology and Research, Dr. Mustafa Ergen, was a speaker during the three day event and he presented how Femtocells are capable of going beyond just providing 3G services. To download and view Dr. Ergen’s presentation, “Femtocells: Not Merely for Providing 3G without Base Stations,” please click here. A recent demonstration from ip.access and AlertMe.com showed how femtocells can be integrated into smart-home energy-management solutions. With femtocell integration, the AlertMe Energy service can automatically detect when the house is empty and power down lights, televisions, and other home appliances. The service also can switch the services back on when the resident returns home. For the demo, ip.access combined the AlertMe Energy service with its own femtocell technology. The solution works by allowing electrical appliances to switch on and off automatically in response to the presence or absence of mobile phones in the home. This “presence” information, which is routinely gathered by the femtocell, is normally only used to route cell-phone traffic and set tariffs. In the demonstration, however, the AlertMe integration enables the presence information to be used to set light and power preferences, which are activated automatically when a subscriber arrives at home. Preset electrical outlets also can switch off automatically to save energy a few minutes after the last person has left the house. The demonstration shows how supplementary service codes on the phone can be personalized through the femtocell when the phone is at home. For example, the phone can be used to remotely switch appliances on and off. The demo also shows how the AlertMe Hub (the central device that receives instructions via the Internet and controls the electrical plugs in the home) can be integrated inside a femtocell access point. It will then rely on the femtocell for power and its Internet connection. In this way, a mobile operator could offer a smart-home energy-management solution as an integrated option to its femtocell subscribers. Via: Andy Tiller in 3G in the Home. Watch them in the order to get a better picture of the applications. To know more about just the lifestyle evolution with NEC Femtocell, see the last video. I was at the Femtocells World Summit yesterday evening attending 'Femtocell Applications Live'. Everybody looked excited and the atmosphere looked charged with people full of energy. Earlier in the morning, Vodafone had announced that its launching first commercial European Femtocell network. There were 12 companies showing their demo. Unfortunately I was not able to capture the complete details but here is summary of my understanding (and notes and photos). Before we proceed further, I should also mention that Femto Forum launched Services Special Interest Group (SSIG) whose main task is to to develop a framework that will simplify the development and deployment of femtocell applications. IP Access showed couple of demo's. The first being Facebook Virtual Fridge Notes Applications and the other Femto-enabled Connected Home Applications. There was some problem with the microphone and also CDMA like interference problems (if someone in the room is shouting, everyone starts shouting and the noice level increase drowns out the useful info) so I diddnt catch the second demo very well. The Facebook Virtual Fridge notes app demo was very interesting and I am sure that we will definitely be seeing apps like this soon. There is very good explanation on IP Access website here so I am not expanding on this. Motorola were showing their award winning Digital Picture Frame Femtocell. It combines the capabilities of a touch screen digital picture frame with femtocells and SIP soft phone. Their femto was CDMA based and are also known as CDMA 9100 series. One of their demo was Video streaming on the mobile through femtocell where they demonstrated point to point video streaming by using electronic programming guide (EPG) and playing selectable videos in QCIF format with 5 to 15 frames per second. Their other demo was to Demonstrate touch screen menu and features on femtocell. Here they showed user interaction capability. Surprisingly you may not find any Femtocell related info on the Sagem website but the friendly people from Sagem explained me all about their products. You can see the Joggler type device in the picture, its known as Tabbee and has been launched by Orange in France. You can read more about it here. Its known as My Home Screen internally by Sagem. There is a similar Dect device launched with Telstra in Australia, internally called as My Communication Center. Sagem is also Alcatel Lucent Partner in their Femtocell development. In the picture above you can see the big femtocell that is soon being launched and the small one in front is the next generation of the same device that is being tested right now. Their demo included Mobile Presence where, when the mobile reaches the Femtozone, different actions are triggered. They also showed how to remotely control TV and other applications through mobile when Femtocells are present. Ubiquisys gave a demo with Intrinsyc. Keith Day from Ubiquisys made clear in the start that they do not make Apps hence they were doing a demo with others. Their first demo was Mobica Podcast Sync App where when you arrive in the Femtozone then this app downloads the latest podcasts and you can listen to them. Once setup, its fully automatic. Could be really useful for me. You can read the press release of this one here. The Intrinsyc UX-Zone is for Android phones. Depending on the surrounding the theme (desktop of phone) changes. When you arrive at home, it will show new apps that were not visible earlier. You can read more about it here. This was a complete new name for me as I have never heard of them before. Their website is here. They were showing IMTV application. IMTV is IM + TV. Their demo showed two different homes having a Quad-Play bundle from their operator. 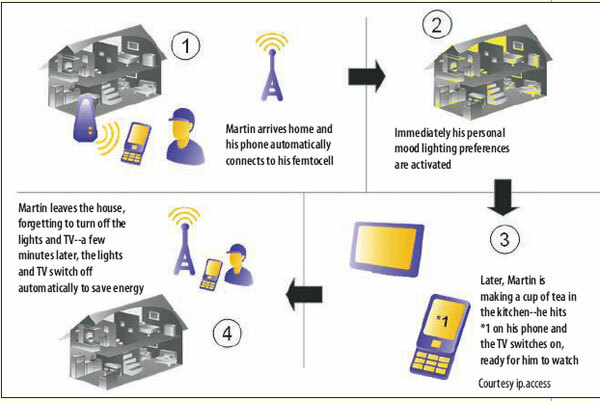 With the help of 3G Femtocell and the set top boxes the two homes can interact via Instant Messaging (IM). It is also possible to share information like what one home is watching to other. The set top boxes are designed with open API so some third party can develop apps using it. Airvana has been in leading position in Femtocells. I always see some of their Femtos being tested somewhere or the other. Their demonstration though not groundbreaking but was done very well. The concept was explained clearly and in a way that anyone can understand. A scneario was created with the person doing demo saying that he has two daughters and whenver they enter the femtocell zone, he gets an SMS saying that they are home. If for example one of them gets their boyfriend then the person will get an alert as whenever a new user camps in the cell, he can monitor. He can also monitor the number of active users so if there is a party, he can find out. Maybe we should call them Femto Spy Apps ;). You can also synchronise the Digital Picture frame to your mobile so that whenever the phone comes in the Femtozone, the pictures are uploaded to display automatically. Another demo was Home notes, a 21st century version of post-it notes, whereby you can text or e-mail your messages to a place delivered only when the user has entered the target femtocell. Somewhat similar to IP Access application mentioned above. Theirs was a simple demo of detection service. When a family member enters the femtozone, you will receive notification SMS. The other was that when the UE is in Femtozone, the handset will be updated with a list of latest services and can enjoy them with single click. By the way, their Femtocells are of different shapes which are quite interesting. For handset as universal remote control, Keypad and display for an X.10 control application hosted by the Femto CPE in OSGi environment. They showed the phone switching a light in the house on and off remotely. There was a video demo showing how useful Femtocell can be in daily life. For example a person is leaving home but has forgotten to close windows, so he gets a notification just when he is locking the door. Also if some friend comes to your house while you are shopping outside, you do not have to rush back. You can remotely unlock your door for him. 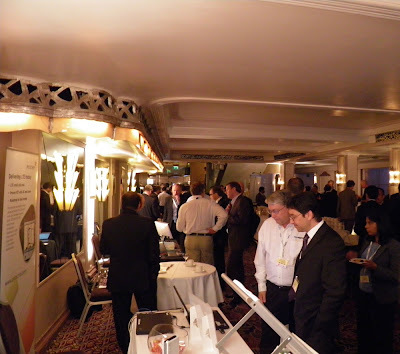 Along with the demo's mentioned above, LG-Nortel was showing their WiMAX Femtocell solution. Then there was Continuous Computing with Starent Networks and PicoChip demonstrating their successful Iuh Inter-operability. And finally, I met heard about another company called Rakon. They make oscillators for femtocells. You can see their flyer here.